This is a US Navy vessel where we lived between missions. It housed the navy's crew, the navy support boats that we took on some of our missions. this vessel held two Infantry companies from the 9th Infantry Division. We would be out on a mission for 48 hours out of 64 hours. The 16 hours between was consumed by returning to the vessel, sleep, read mail, get clean clothes, and then in route to the next mission. Sometime we would be inserted from the river via the navy's Tango boats. This shows getting ready to get inside the Tango to head on the next mission. . The boats would beach us by pulling 90 degrees into the bank and drop the ramp for us to exit. If the Tango convoy was ambushed in route to the landing zone the Navy boats would return fire as our job was to stay down so we would be intact to complete our mission once beached. At the beginning if the targets were near the water one unit would go in by Tango boats and and the others inserted behind the target via choppers. Both units would move in to enclose the target. Policy change from going in by Tango boats to all air mobile insertions. Our loses increased due to increasing times when the Tango ramp would drop and we would be "met" with enemy fire bouncing around inside. 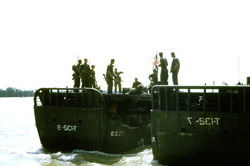 The South Vietnamese would then ride the Tango boats for their missions. 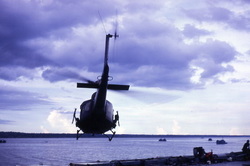 We became an all Air Mobile Unit racking up the frequent flyer miles by flying in into all of the landing zones.